-Everyone with a ball are the mice, they are dribbling around and must protect their &apos;cheese&apos; which is the ball. Play 90 second rounds - players do not want to be the ones without their ball at the end of the session. -Spacial Awareness: Identification of Space, Player, Safe Zones Etc. 4 Corner areas. Players are divided into 3 Teams of 4 players. One player from each Team are inside each corner area. (Make sure we have less number of players per Team possible). The Triathlon starts with one corner, the aim is to run into the next corner, switching places with teammate who will run to next corner. 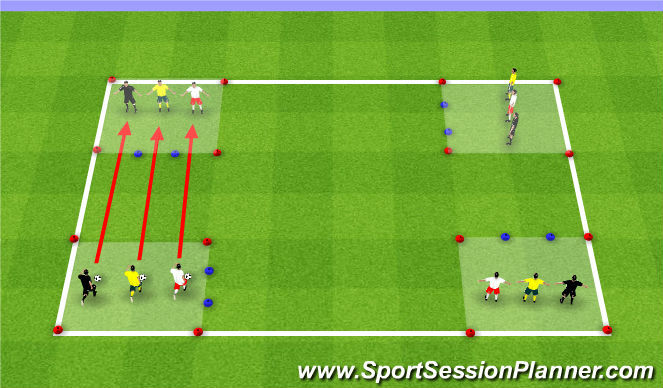 After introduce the ball, they have to dribble giving ball to their teammate..
Have cones spread in front of each corner area , now players have to run and dribble through the BLUE gates formed. Same 3 teams are positioned in lines with 1 ball per team. Two cones in front of each line. The aim is to dribble around each cone in front and take a shot on goal behind the restricted line. Retrieve your ball and go back to your line. -Body turns with every touch around cones. 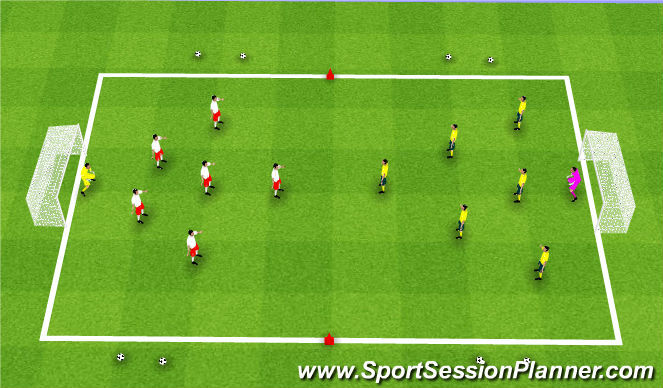 -Players placed on to a field 35x45 into 2 teams of 5 or 6. -If ball goes out of the field players can make the decision to either pass or dribble in. Once the ball has been saved or gone out for a goal kick the defensive team must retreat to the Retreat Line at halfway.